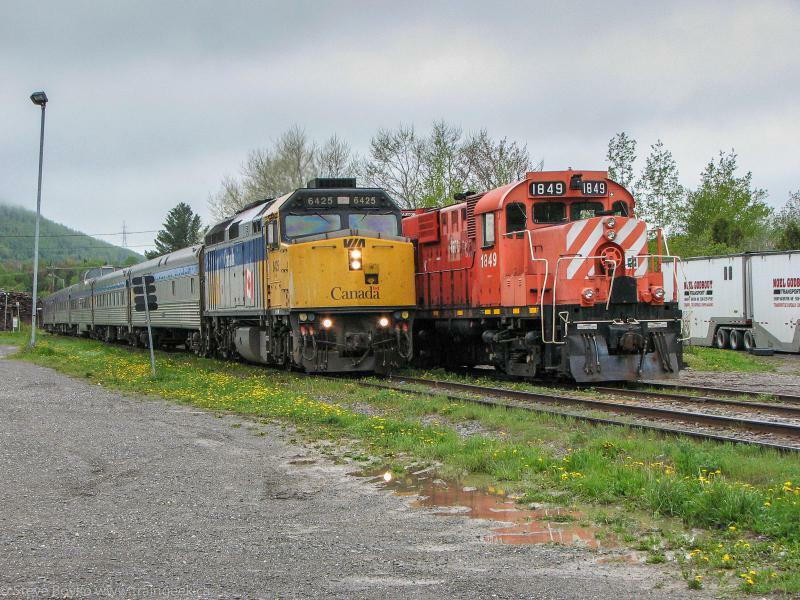 The Quebec government has come to the rescue of the Gaspésie Railway. After serious financial troubles that threatened to shut the railway down, the Quebec provincial government has purchased the rails, assumed the debt, and will pay for repairs to the track between Matapédia and Caplan, and between Anse-à-Beaufils and Gaspé. My understanding is the government will own the rails but not operate the trains. The existing operator, le Société de chemin de fer de la Gaspésie, or the Gaspé Railway Company, will continue for at least the next 19 months. Previously the private industries along the rails were readying a proposal to privately bail out the railway to continue service. The section between Matapédia and Caplan is currently used for freight service, with the Temrex lumber in Nouvelle-Ouést and Gaspésie Diesel in New Richmond. The section between Anse-à-Beaufils and Gaspé is used by the l'Amiral cruise train. Note that Caplan is short of New Carlisle, where VIA's train would typically turn when not running all the way to Gaspé. This doesn't bode well for the return of the Chaleur any time soon, as there are no facilities to turn the train between Matapédia and Caplan. At one time there was a wye at Carleton (visible on Google Maps) but it doesn't exist any more, and it wouldn't be useful anyway as the Chaleur would have to back up for 34 miles to turn on it. I see this as a positive step and will ensure freight service for a few years. However there needs to be more customers on the line to make it sustainable. A few cars from Temrex and Gaspésie Diesel are not enough. The line has many bridges and these are expensive to maintain. There is a lot of hope with the $1 billion McInnis cement plant proposed for Port Daniel, which had good support from the government (both the previous PQ and current Liberal government). The lack of support for the middle segment is very troubling and calls to mind the controversy over the Bathurst-Miramichi segment in New Brunswick.